Richelieu Rock is the probably one of the best dive sites in the world and is definitely the best in Thailand. It is situated fairly close to the Surin Islands and is famous for whale sharks sightings whilst on a liveaboard diving trip or day trip. What Makes Richelieu Rock Diving so good? 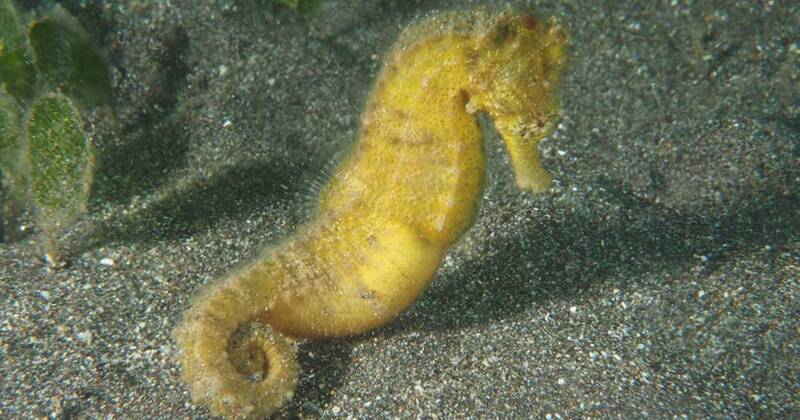 Yellow Thorny Seahorse at richelieu rockSoft corals and resident marine life at Richelieu Rock are always there. Regardless of what day of the diving season you visit, you’re guaranteed to be in awe of so much colourful life. The red and purple soft corals are what you notice first and most. But after a few minutes underwater, you will see plenty of healthy hard corals and abundant marine life species that have made Richelieu Rock their home. Right from the surface down to more than 30 metres deep, there are hundreds of species and hundreds of thousands of individuals. These include bony reef fish, invertebrates and the occasional reptile. 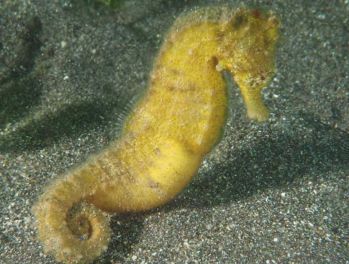 The resident Yellow Thorny Seahorse, which is normally around 32m. deep, is possibly the most-photographed individual here, closely followed by the Ornate Ghost Pipefish which is a few metres shallower. Even diving professionals who have visited Richelieu Rock plenty of times still get excited about what may be in store when they step into the crystal-clear warm water. Manta Ray (Manta aflredi) at Richelieu Rock pinnacleVisiting pelagic species are what most divers hope for, especially those who haven’t been here many times or seen many big fish. The Whale Shark is the largest fish in the world, and they are often seen here during the diving season, although reported sightings each year have been getting fewer and further between. 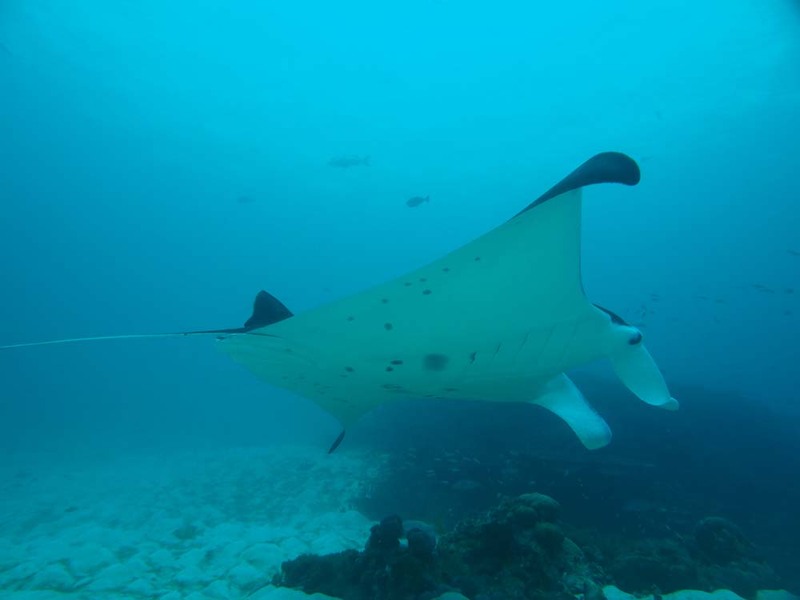 Manta Rays are very graceful, large filter-feeding rays that are always very popular among scuba divers. Although they tend to be seen more at Koh Bon than at here at Richelieu Rock, sightings are not uncommon. There are other rays, sharks and bony fish that swim around the Andaman Sea all their lives and sometimes pay Richelieu Rock a visit on their travels. The problem is that with so much to see on the reef, turning around to look out into the blue isn’t easy. Its location is perfect for great scuba diving experiences. 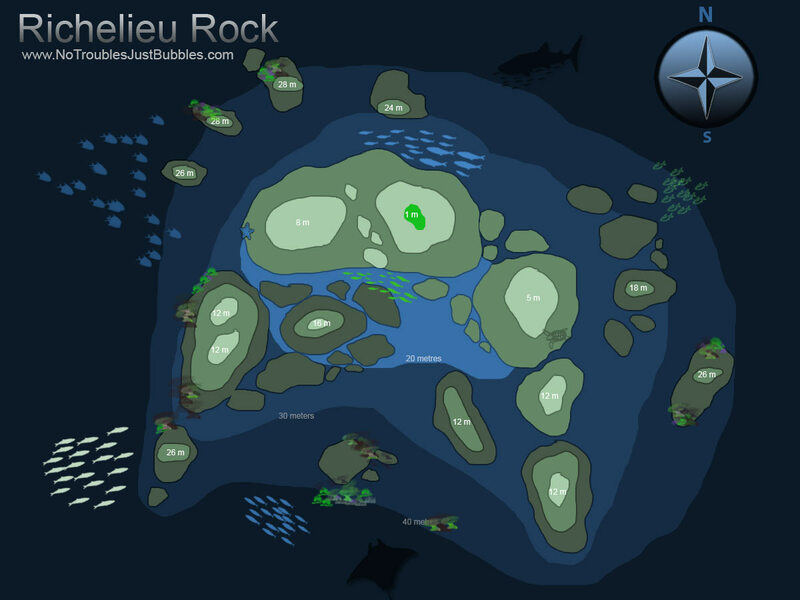 Richelieu Rock is located far from the mainland or any other islands, and it is surrounded by deep water. Therefore, currents push cooler nutrient-rich water up to the reef’s pinnacle, and that enables the marine life here to flourish. Also, with nothing else around, life condenses here as it is a home, a haven, a cleaning station, and somewhere for predatory species to feed. Its size ensures that not only lots and lots of life can flourish here, but also divers can visit Richelieu Rock up to three times in one day without getting bored. Also due to its popularity, there are usually several dive boats here but the large area that Richelieu Rock covers means that divers aren’t bumping into each other because there’s plenty of space for everyone. Sea conditions don’t affect its appeal because even if the visibility or currents aren’t ideal, you can still have a wonderful dive at Richelieu Rock. because there is so much life at Richelieu Rock, even if the sea isn’t as clear as normal, there is so much to see, such as smaller reef species. Many other dive sites can be boring or even dangerous if the visibility is reduced to less than 10 metres, but at Richelieu Rock it’s no problem. You can just focus on the thousands of animals in all the nooks and crannies. And low visibility is usually caused by plankton blooms, which of course are food for filter-feeding giants. So, the chance of a Whale Shark or Manta Ray being in the area is greater. The shape of Richelieu Rock means that even if there is a medium or even strong current, divers can easily find shelter from the main pinnacle or surrounding topography. How to get to Richelieu Rock? 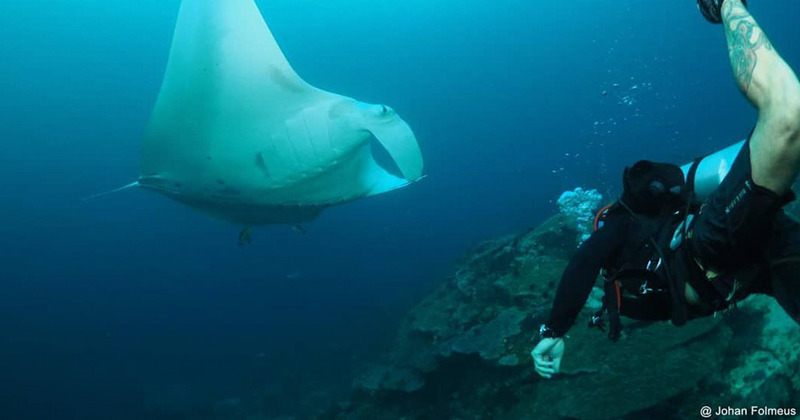 You can get to Richelieu Rock either by a liveaboard dive boat or a day trip dive boat. Most liveaboard trips are combined with trip trips to other dive sites such as Surin Islands and Similan Islands. The liveaboard trips are usually around 4 nights on board. Trips leave from Khao Lak and Phuket but mostly from Khao lak. Richelieu Rock can only be accessed by liveaboard or day trip boat (there are no public ferries). There are flights to Phuket international airport from around the world. Flights from Bangkok are cheap on budget airlines (flight is around 1hr). Khao Lak is about 1 - 2 hrs from Phuket International airport depending on traffic. A bus trip from Bangkok to Phuket takes around 13hrs. A bus trip from Khao Lak takes around 12hrs. When is the best time to dive at Richelieu Rock? Liveaboard diving trips to Richelieu Rock are available from 15th October to 15th May out side of these dates Richelieu Rock is close for diving because of rough seas and to help perserve marine life. What Is Less Than Good About Richelieu Rock? It’s not for novice divers because of the depth and potential currents. Even though some dive centres take new divers to Richelieu Rock, it’s better if you have more than 20 logged dives. The reasons for this are hard to explain, because the reef is healthy and colourful right up to the surface and currents can be sheltered from. However, it is generally considered that more experienced divers are able to better enjoy The Rock, and stay underwater for the full dive time of one hour.